One of our goals here at Mission Cheese is to connect our community with their food. Food doesn't come from a grocery store (or a cheese shop! ), or a restaurant. Behind every bite we take is both an environmental and a human story. There are people who grow it, tend it, worry over it, process it, and bring it to us here in our little city apartments. 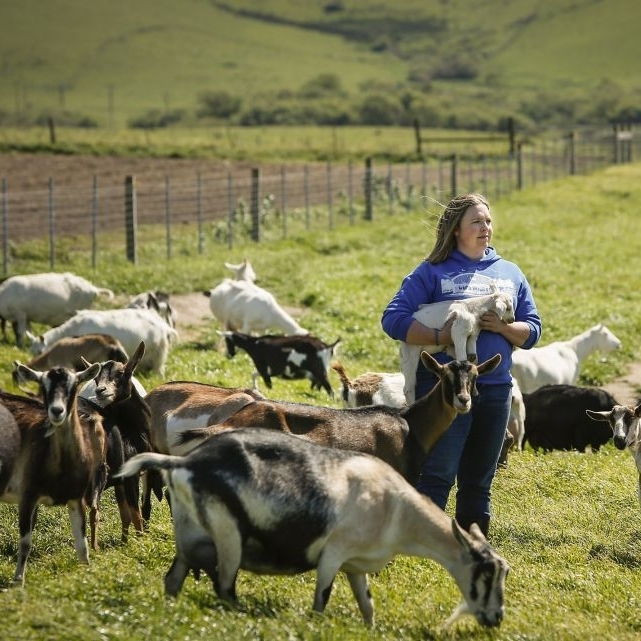 The Bay Area is home to an amazing array of these dedicated, passionate farmers and makers, and we at Mission Cheese hope to be able to share their stories. One of our absolute favorite ways to do this is by visiting as many of our local farms, creameries, breweries, and wineries, as we possibly can. It's a difficult job (all that tasting! all that nature! ), but somebody's gotta do it. It was with this lofty goal of local food evangelism, er, education, in mind that we stepped out of our cars at White Whale Farm, home of Pug's Leap Creamery. And it was with this lofty goal still firmly in mind that we were immediately sidetracked by a small shed full of baby goats. Y'all, I said baby goats! Less than 5 minutes after we arrived, most of us were cooing and giggling and attempting to snuggle a pile of friendly, bouncy, hungry kids. Luckily, owner and cheesemaker Anna, found us easily; she saw our car and knew just where to look. After getting in a little kid-time herself, Anna offered to show us around White Whale Farm, and introduce us to the farm dog, Samson, as well as the rest of the goats. Who could say no to a dog and more goats? Off we went to the goat barn, where we were greeted by Samson, an Anatolian Shepherd I suspect is actually part polar bear. Sam then introduced us to his herd, a mix of mostly Saanens and Alpines, with a few La Manchas and Nubians thrown in for good measure. After we'd had sufficient time communing with the goats, Anna took us to see where the magic happens. The milking parlor, cheese making, and aging rooms, are really the heart of any farmstead creamery. All the work and love and hope and joy of the farm is essentially distilled there into single, perfect bites. As I said, magic happens. The milking parlor and cheese making and aging rooms are all housed in the farm's original barn, built in the 1850s, but they only take up a small portion of the expansive space. Past the milking parlor, Anna led us up some ancient stairs, assuring us there were "mostly sound," and onto the barn's beautiful upper floor. The sun streamed in through the old hay door, and a long rope swing hung from the rafters above. Anna's favorite farm cat, Butch, was even there requesting pets and cuddles. Paradise. We set up a picnic table, dragged a few hay bales over to serve as benches, and got down to arguably the best part of any producer visit, the Tasting. Anna makes 3 cheeses: the tiny, delicate Petit Marcel, the dense, flaky, melt-in-your-mouth Pave, and the firm, sweet, grassy Tomme. We tried Tomme's from two different make dates, so we could taste her evolving recipe and flavor profile, a couple beautiful little truncated pyramids (the Paves), and, my personal favorites, a little pile of some unique looking Petit Marcels. Anna tried to apologize for their appearance; they'd grown a mottled covering of powdery, blue, gray, and white molds over their formerly delicate cream colored rind, because they were older than she would normally release them. What a treat. Yes, I'll say it again. What a treat! In the United States, customers often return young goat cheeses like the Petit Marcel to the store when they see the blue and gray molds, if they buy them at all, thinking that their delicate little cheese has gone bad. Because of this most cheesemakers don't even send out cheeses that show signs of developing those molds. The secret is, though, that these Little Uglies, as Anna affectionately called her older Petit Marcels, are absolutely delicious. The flavor goes from bright, delicate, and tangy, with mild yeasty notes, to deeply buttery and grassy, while those mild yeasty notes intensify into a downright bready undertone. The texture of the cheese gets more toothsome, and as you chew it melts into a mouth coating paste that sticks with you like peanut butter. In other words, these Little Uglies had done the opposite of going bad, they'd gone, well, Even Better! Naturally we brought some back to monger at Mission Cheese. After gorging ourselves on fantastic cheeses, wine, beer, fresh bread, fruit, and...well, let's just say we did not leave hungry, it was time to say goodbye to Pug's Leap and Anna (and Sam and the kids) and head back to our little shop to spread the good word (which is Cheese, in case you weren't sure). Thank you, Anna, for sharing your beautiful home with us for the day. We now carry your story with us, and hopefully we can impart some of the dedication and love you put into your cheese to our customers.